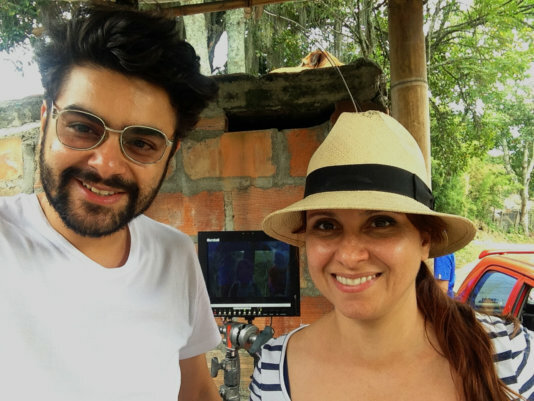 The Colombian artists Wilson Arango and Edna Sierra have directed and produced, respectively, ‘Route 60’, a short documentary released this month. The film shows the dispute in the 1990 and 2000 decades between the different actors of the Colombian conflict over this route that connects the capital city, Bogotá, with Medellin, the second largest city of the country and its effects on the inhabitants of the area, many of whom were forced to flee. FAIRPLANET spoke with the film makersabout the political dimension of their film. FAIRPLANET:What do you want to capture with this documentary? Wilson Arango: At some point of the conflict, more or less between 1995 and 2005, Route 60 became a zone in dispute. Violence ravaged this zone, that includes in the Antioquia department (whose capital city is Medellín) around eight important villages. Almost all of them were taken by the guerrilla or the paramilitaries, there were massacres… Rather than being a chronicle about what happened, ‘Route 60’ tries to reach out to the pain, the uprooting suffered by many rural communities in this territory. It comes back to the memories of the people who had to leave their homes and who nowadays have returned. Why was it a zone so fiercely disputed? Wilson Arango: When you ask the people there, they don’t have the answer very clear. They are just in the middle of the conflict and their main concern is survival. But when we investigated we found out that it’s a zone with many hydroelectric power plants and it’s the most important energy production area in the country. Edna Sierra: Besides, it was a strategic zone for the transport of important commodities. The beginning of the documentary it’s an archive long take where you can see a lot of trucks with goods burning. Many companies, national and international ones, could go through this route anymore to take their products from Medellín to Bogotá. That’s one of the reasons for the rise of paramilitarism in that area: Many companies financed the paramilitary groups to protect their goods. Why did you decide to focus the documentary in this zone? Wilson Arango: This project is the result of a work meeting with the House of Memory Museum, that coproduces it. They had made a very exhaustive investigation of this matter. The intention was to make these testimonies known because even in the city Medellín, very near the zone, many people don’t know what happened there. For us, it was very important to leave a record of it. How is the situation in the zone after all this time? Edna Sierra: I remember that time when you couldn’t go to Bogotá nor some Antioquia villages by road because you could be caught in a ‘miracolouse fishing’ (a random kidnap in a guerrilla checkpoint). There was a surge of kidnappings in that zone in those days. People from Medellín didn’t dare to go to Bogotá by road. Only very reckless ones did it. When we went there to shot, the locals were more assured. In the documentary, they say ‘Those people aren’t here anymore’. And by ‘those people’ they meant the guerrilla and the paramilitary groups. In that road, there are now many military checkpoints, but there’s still a fear of an uprising of violence. Wilson Arango: Anyway, things haven’t changed because the conflict moves from some territories to others. There has been a decrease in violence but it went to another region. At the national level, the conflict isn’t resolved. Nowadays Colombia is still in a very complex situation. We are in a post-conflict, FARC (Revolutionary Armed Forces of Colombia, the leftist guerrilla who has been fighting for the power for five decades) is over. You think that things are going to change, but then you realise they have not. How severe has been the problem of the internally displaced people, one of the less known aspects of the Colombian conflict outside? Wilson Arango: It’s difficult to determine. Their problem is that they are not admitted as such. In the last 20 years, more than three million people have been internally displaced. Many of them went to the cities, they invaded zones and build in them in spite of not being ready for that. That generated new situations of violence, new social problems. People who had left the countryside is absorbed by the violence in these new neighbourhoods in the cities and the chain goes on. Just here, in Medellín, about one million displaced persons arrived over those years. What are the expectations of the returned people in Route 60? Edna Sierra: We have made a kind of road movie so we didn’t get into the villages far from the route and next to the road there are many shopkeepers. Some of them are very optimistic because they can have now their stores and sell to the people traveling by the route. They say that the fact that the Army is there means that there is State presence. But, some others are not so optimistic. Wilson Arango: They are people that don’t feel the war as a political ideology matter, but they just try to live from one day to the next. They only care for sell something that allows them to eat each day, so they are now assured. Before, no matter if there were guerrillas, paramilitaries or even the Army, they were in the middle and couldn’t lead a fairly normal life. Has some benefit got to the victims of the conflict from the peace process? Wilson Arango: We have approached this issue not only in ‘Route 60’ but also in other productions and we have also been working with victims associations for many years. That’s a question we have made constantly and most of the victims have been in favour of the dialogue, of finishing with this because they are who are experiencing it personally. They know very well that nothing good can come from it. That’s the bid conclusion of ‘Route 60’. The last words of the main character are ‘Who has won this war? We don’t know’. Finally, we do know who are the losers. Moreover, we can see at a political level the same plays, the same pieces and that everybody is increasingly more polarized. But this is happening not only in Colombia but also in the rest of Latin America and the world. Edna Sierra: The sad truth is that those who have directly suffered because of the conflict are more supportive of the peace process than those who have just lived it through the television and the media. What do the victims expect from the peace process? Wilson Arango: Their main concern is still to get the truth exposed. Is what they ask guerrilla members, but everybody silence it and they are aware of it. Actually, their main gain is to avoid further casualties. They are aware that the price to pay for that is that they won’t get access to the whole truth, and that is easier to get some of the truth when we are not killing each other. They expect at least to bring a change, to make something different, to stop killing ourselves this way. I don’t know if this is being achieved. It’s too soon to know. What role can play the audiovisual artists and the documentary genre to contribute to peace? Wilson Arango: Colombian cinematography has got some advances in the last years, especially after the passing of a Cinema Law and the production have increased considerably. And most of the new films raise questions about the conflict. I’m not so interested in the conflict as such, but in the conflict related to death, war, life… existential issues. But I feel that Colombian authors want to talk also about that. In their subjects, the cinema is wondering about the reality and the context of the country. We don’t want to make an ideological, but to raise questions about our context. We are just telling what surrounds us. Edna Sierra: The peace policies are trying to promote places where people who have been involved in the war can express themselves, to find their voices. We are trying to accompany the reparation of the victims’ policies y I think that we can do it through the art. What is the mission of the House of Memory Museum, co-producer of ‘Ruoute 60’? Wilson Arango: It’s an institution created by the Medellín Council and financed by the municipal budget. It tries to build a narrative of the conflict from the point of view of Medellín’s victims. It’s a safeguard of the memory, but they also have a proactive role. It’s not just an archive, but a place where the victims can work in the construction of a narrative of the conflict as they have experienced it. Many victims’ associations turn to the museum to find a place to meet, to make workshop. It has a library, it organises events, art labs and many more. At some point of the conflict, more or less between 1995 and 2005, Route 60 became in a zone in dispute. Rather than being a chronicle about what happened, ‘Route 60’ tries to reach out to the pain, the uprooting suffered by many rural communities in this territory. A comprehensive nutrition response has been stalled by a lack of data on the scale of the problem and ongoing political crises in Colombia.